Featured Image: Representation of George Adamski during his close encounter. Credit: vesmirni-lide.cz. 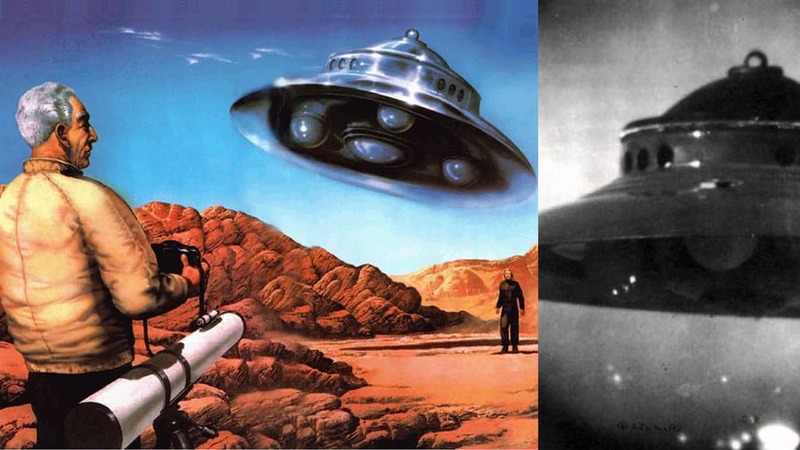 Right: Adamski’s UFO. In 2017 I was surprised by the publication of WE ARE HERE! “Visitors Without a Passport: Essays on Earth’s Alien Presence ( Source ), where the researcher and writer Michael Zirger, a native of France, and currently living in Japan, shook the UFO scene with its incendiary revelations. And no wonder, since Zirger declares, George Adamski actually had an encounter with an otherworldly being in 1952. These statements have to be said by Zirger, have caused real commotion, initiating an endless debate, and where the figure of Adamski returns to discuss, despite being considered a fraudulent case by many scholars. What happened in the North American desert of Mojave in the 50’s, where Adamski accompanied by other witnesses, was the protagonist of a meeting with a supposed alien of Venus , was transformed over time into a questioned story, and ruled out by its improbability. Not even the evidence of a trace product of that historical contact, apparently bequeathed by the alien visitor, reproduced in a plaster mold, and plagued by strange symbols, managed to change the opinion of the international community about what happened. Neither the photographed ship, the result of that event, and that was later published in a local newspaper The Phoenix Gazette , distorted the opinion about what happened on November 20. Simply, that was read as too amazing. On the other hand to think of Venus as a planet fit for life , was to challenge the existing scientific canons, which denied any kind of civilization could be developed, in an atmosphere defined as almost unbreathable. As I say, these and other approaches, as well as the behavior of Adamski presenting himself as a contactee with spatial intelligences, prevented for many decades to deduce the taboo between the researchers, being the witnesses of this first litter, and protagonists of that time so active in how much UFO manifestation , highly resisted by the ufologists themselves. But the irruption of Michael Zirger, who just published this year, a continuation of his previous installment, Authenticating the George Adamski Case: The Desert Center Investigation ( Source ), makes us wonder if we really face an authentic fact, that of verifying its veracity, would sow a new stage in how much our conception, on such a controversial subject. These questions led me to want to meet Michael Zirger, getting to exchange information about his research, providing me with first-hand data. From now the reading public that decides to address the reading of these works, which at the moment we only have in English, will be amazed with the contribution of Zirger, who presents both text and photographic documents, very revealing, and evidence by moments, overwhelming. Another player of importance in parallel with Michael Zirger, is Rene Erik Olsen, a Danish artist who has worked digitally on the shots taken by Adamski, during his meeting with the Venusian Orthon , not without some controversy, for the manipulation that some see in them. But the result is fascinating! However, personally, the alien question is far from convincing me, and makes me suspect that it could be a mere camouflaged, where something, or someone, tries to divert attention. I am of the opinion that the Earth continues to hide many secrets, being its deciphered, an issue still pending. The Adamski case represents only the tip of the ball, we are attentive, perhaps in the future we will have more answers.